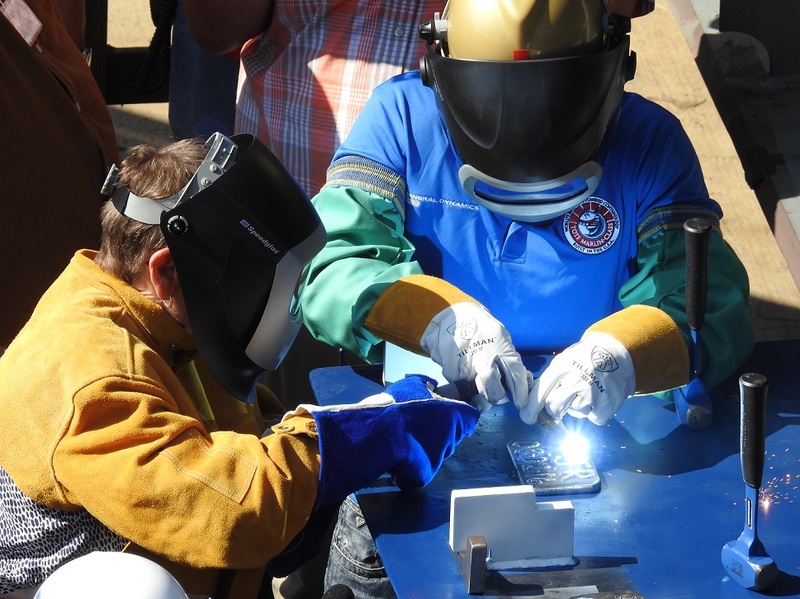 On Tuesday, August 2, General Dynamics NASSCO hosted a keel laying ceremony for the future USNS Hershel «Woody» Williams (T-ESB-4), the U.S. Navy’s second Expeditionary Sea Base (ESB) currently under construction at the company’s San Diego shipyard. The ship’s namesake, Hershel Woodrow «Woody» Williams, spoke at the ceremony, and his two daughters, Travie Ross and Tracie Ross, welded their initials onto the keel of the ship. Williams, a retired U.S. Marine, received the Medal of Honor for his actions in the Battle of Iwo Jima during World War II. He is the last surviving recipient of the Medal of Honor from that battle. «The story of Hershel ‘Woody’ Williams is remarkable. It’s a story of valiant devotion, extraordinary courage and American heroism», said Kevin Graney, vice president and general manager for General Dynamics NASSCO. «We have the distinct honor of constructing a ship that will reflect the strength and fearlessness of its namesake and will provide global, advanced capabilities for future generations of Marines and sailors to come». USNS Hershel «Woody» Williams (T-ESB-4) is the Navy’s second ESB ship. The 784-foot-long/239-meter-long ship will serve as a flexible platform to support a variety of missions, including air mine countermeasures, counter-piracy operations, maritime security and humanitarian missions. The ship will provide for accommodations for up to 250 personnel, a 52,000-square-foot/4,831-square-meter flight deck, fuel and equipment storage, and will also support MH-53 and MH-60 helicopters with an option to support MV-22 tilt-rotor aircraft. The ship is expected to be completed in the first quarter of 2018. 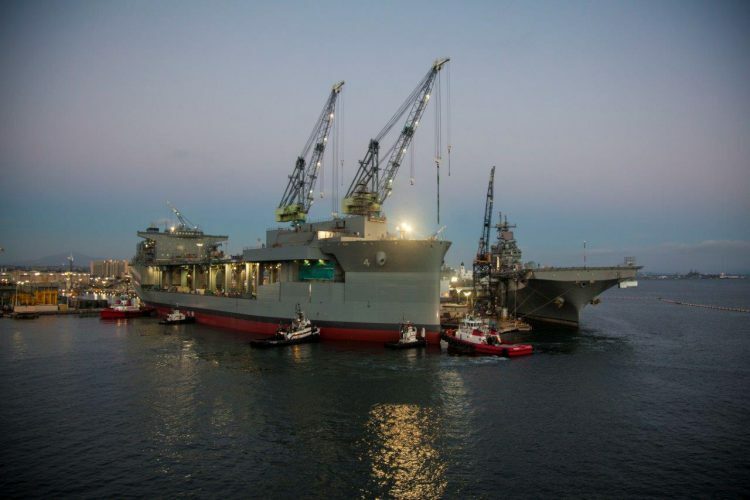 General Dynamics NASSCO has delivered three ships in the class to the U.S. Navy: USNS Montford Point (ESD-1), USNS John Glenn (ESD-2) and USNS Lewis B. Puller (T-ESB-3). 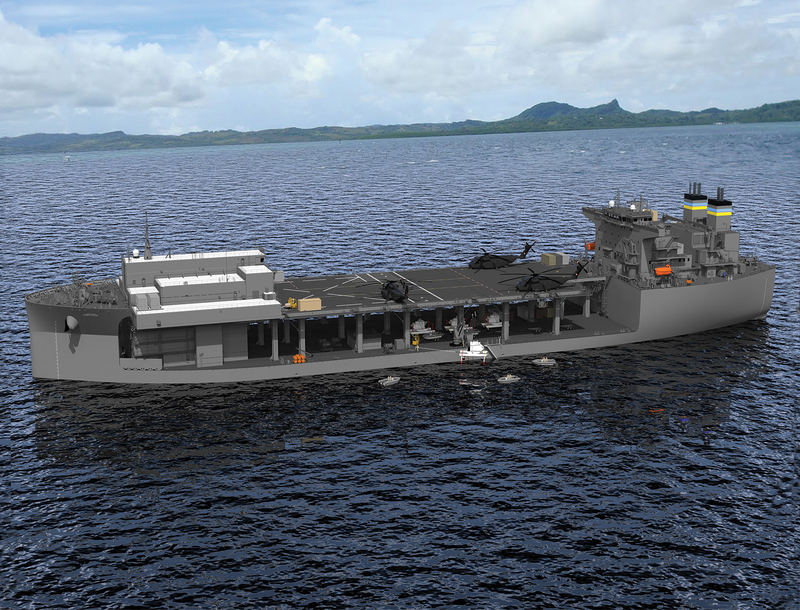 USNS Hershel «Woody» Williams (T-ESB-4) is the fourth ship to be constructed by NASSCO shipbuilders under the program and a fifth ship is currently under contract for advanced procurement. 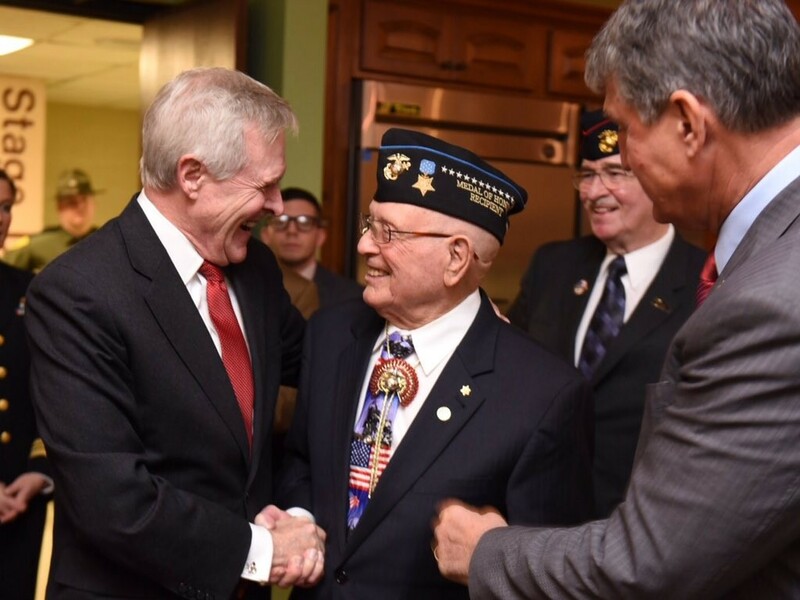 Secretary of the U.S. Navy Ray Mabus announced the Navy’s newest Expeditionary Sea Base (ESB) ship, T-ESB-4, was named USNS Hershel «Woody» Williams during a ceremony in Charleston, West Virginia, January 14. Hershel «Woody» Williams, the ship’s namesake, was born in West Virginia and joined the Marine Corps following the attack on Pearl Harbor. In 1944, after serving in Guadalcanal and Guam, he joined the campaign in Iwo Jima. Two days after arriving on the island, Williams picked up a 70-pound flamethrower and walked ahead of his infantry’s tanks for four hours clearing their path of enemy machine gun fire. President Harry S. Truman awarded him the Medal of Honor two years later for his actions. The new 785-foot-long/239.3-meter-long vessel will feature a 52,000 square foot/4,831 square-meter flight deck, fuel and equipment storage, repair spaces, magazines, and mission-planning spaces. 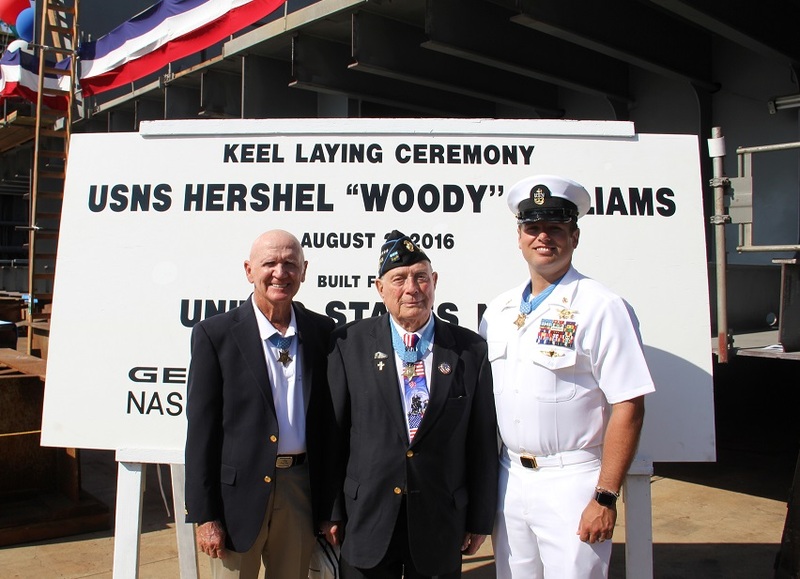 USNS Hershel «Woody» Williams will be constructed by General Dynamics National Steel and Shipbuilding Company (NASSCO) in San Diego. The ship is expected to be delivered to the Navy in 2018.